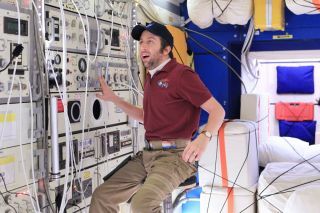 Actor Simon Helberg, portraying Howard Wolowitz on CBS's "The Big Bang Theory," is seen "floating" on the space station. Howard Wolowitz is still in space. The fictional aerospace engineer and Expedition 31 crew member was seen floating aboard the International Space Station (ISS) during last week's season premiere of the CBS hit television series "The Big Bang Theory." On this week's episode, airing tonight (Oct. 4), Wolowitz is still off the planet, 250 miles (400 km) up. Of course, he is not really on the space station. The real ISS Expedition 31 ended in July. Wolowitz, or rather actor Simon Helberg, was on a sound stage at the Warner Bros. studio lot in Burbank, Calif.
His spacecraft surroundings never orbited the Earth, but they did play previous host to the Energizer Bunny for a Super Bowl commercial and were seen in the 2004 feature film, "The Day After Tomorrow." Behind the scenes, the job of delivering Wolowitz to the orbiting outpost didn't fall to a Russian rocket but rather to The Big Bang Theory's production designer John Shaffner, set decorator Ann Shea and their teams. As it turns out, you can rent a space station. Last May, when the show's fifth season finale called for Wolowitz to launch onboard a Russian Soyuz spacecraft, Shaffner went looking for one. "The first thing that we always do in this business is ask, 'Well, can we rent it? Did somebody make one first?' And unfortunately, we discovered that there weren't any Soyuz replicas to be found," Shaffner told collectSPACE.com in an interview. For the Soyuz, Shaffner and Shea received photos from NASA, turned to a Kansas museum to find dimensions, and scavenged parts from an aerospace junkyard in Los Angeles to piece together a realistic capsule. But in the course of his seeking out the spacecraft, Shaffner found a space station. "So when the call came this summer from the producers that we need the space station, I was able to immediately say 'Well guess what? No fear. Let me make sure we can put it on hold,' which I did immediately," Shaffner recalled. From the outside, WonderWorks' space station set for rent looks more like an elongated shipping crate, but inside are the replica science and equipment racks, panels and hand holds that form the general layout and appearance of the real space station's laboratory module. Shea's challenge was making it look lived in, like the orbiting complex. "I collected things that looked like what was in the actual space station," Shea told collectSPACE.com. "I watched the video of the station probably 20 times, trying to pick out all these different things and there were so many surprises in the stuff you saw attached to the walls with velcro so they wouldn't float around." "There were camera lenses for some reason, there were toothbrushes, pens, family photographs and lots and lots of different cases of things," she said. "They even had this sort of Halliburton case, or it looked like a Halliburton case, that was a food warmer, somehow — I can't imagine how that worked. So, I got one of those and we labeled it 'food warmer.'" With only 20 feet or so (6 meters) of space station set to work with, Shaffner got together with the directors, visual effects supervisors and cinematographers to use unique camera angles and creative framing to create more 'space' than there really was. They also added a section to the rented module to allow other actors — the other station crew members — to enter and exit, giving viewers a sense that a sprawling outpost continued beyond the lab. "We really examined ways we could reimagine the spaces we added," Shaffner said. Part of that was made possible by the way they achieved the appearance of weightlessness. Rather than raise the roof and suspend the actors by wires, the solution came from below. "It was done by supporting the people from underneath," Shaffner revealed. "There was a very long, sort of skinny platform that a person could lie on and it would almost look like they were swimming through in weightlessness." The actors also deserve some credit, said Shaffner, for mastering the motions of microgravity. "They studied and really did a remarkable job with acting the weightlessness," he said. Having a real astronaut on the set offered a chance for some immediate feedback. Massimino reprises his role on the show for this and next week's episodes. "His response was immediate and really positive," Shaffner said of Massimino's impression of the spacecraft. "He was so blown away by [the set]. He said, 'Wow, you guys really did an amazing job! This really feels like it. This is really how big it is, it is not very big.'" "He was very, very appreciative and I think in the end that made everyone involved feel extra good about it," said Shaffner. "We had all pulled together to make this real for him and he got a really big kick out of it." Beyond wanting to please Massimino, the attention to accuracy was rooted in the show's long commitment to serving the storyline by being honest and truthful with its visuals. "We are all very committed to making sure that we don't want ever the set or the visual environment to not make you believe the story, to take your interest and your mind out of what the characters are living through and start questioning authenticity," Shaffner said. "So we work very hard on creating our authenticity, and it is a theatrical authenticity to some extent. But by really looking and researching and trying to make it honest and authentic, we believe it helps the storytelling," he said. Continue reading at collectSPACE.com for an exclusive look and the details behind the mission patch created for and worn by Howard Wolowitz and Mike Massimino on CBS's "The Big Bang Theory."